Weighing 25% less than classic Camalots, the Black Diamond Ultralights are the best cams for light ‘n fast technical ascents. 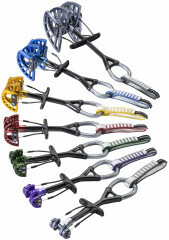 Use them for protection while climbing and as an emergency anchor on the descent. The lobes have been exquisitely machined to save weight and anodized to stay clean and color-coded. A Dyneema-core stem has been employed which further sheds the grams without sacrificing strength as protection. Careful attention to detail is evident on the stem and thumb loops. The BD design allows for precise placement and a secure grip every time. While we are skiers first and foremost, sometimes you have to be creative to gain access to ski lines. The Black Diamond Ultralight Camalots have your back in a crack and are a great addition to your adventure arsenal. Double-axle allows for a massive usable range, letting you carry fewer. 14mm Dyneema tape sling contributes to the strength and weight savings. Anodized brightly for quick size-selection.